Many businesses today are app or Internet-based, which means that they have no brick-and-mortar counterpart and, more often than not, these companies offer their goods and/or services to a global audience. As such, registering these businesses in the same location in which their founder resides may no longer be a necessity. Many Internet-based companies have a founder in one location, a developer in another, and a UX designer in yet a third, not to mention further staff that can be working out of any country on the planet. Additionally, as such businesses are found online, they do not have to be tied to any physical place such as where their staff are located. Registering the company in an offshore jurisdiction, therefore, can be an ideal solution for companies that trade over the Internet. The setting up of an International Business Company (IBC), a Limited Company (Ltd), or a Limited Liability Company (LLC) works well for Internet-based businesses as these can offer reduced to no local taxation requirements to the company. They also allow for the streamlining of invoicing partners and/or suppliers with which the company works, as well as simplifying the means through which employees are paid. What’s more, if the e-commerce business includes original ideas and applications, the offshore company can hold intellectual property, patents, and other immaterial assets on behalf of the company’s creators, further securing them in jurisdictions that often offer far lower maintenance costs than onshore incorporations. The use of a nominee director and/or shareholder is also a commonly available option in such jurisdictions. Incorporating an IBC in Belize, the British Virgin Islands, or Anguilla is a good choice for an Internet-based business, as these jurisdictions can form a company in a matter of days, after which an international bank account can be opened to permit your company’s financial transactions. Once the bank account of the company has been established, an Internet Merchant Account — which will simplify the online transactions the company’s customers will want to make for the goods and/or services offered — can also be set up. Furthermore, as an Internet-based business may not have a particular headquarters, a Virtual Office can be opened in order to simplify matters when it comes to having suppliers or customers reach out to the company. SFM offers Virtual Offices in Geneva or London, , and this can include company domiciliation or correspondence services such as telephone answering services, message and facsimile receipt, and mail forwarding, which means that the company’s owner(s) can rest assured that no partner or client is being overlooked. 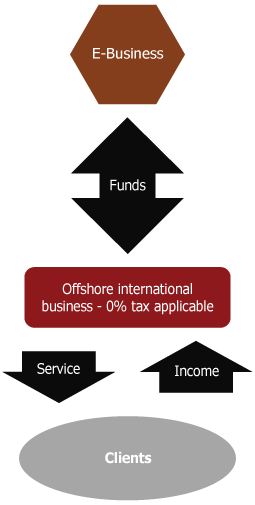 SFM works across more than 15 different jurisdictions and we offer businesses the possibility of forming an offshore incorporation in as rapidly as 24 hours. Your company may then open its international bank account within a matter of days.